If you sell your car privately it is vitally important that you make sure the change in ownership is properly documented with the state. Otherwise, it could haunt you. I often represent people who have bought defective cars and I have been discussing automobile sales with people now for 23 years. While many people focus on the car they are buying, the car they are selling needs some attention as well. Especially if you are selling it to an individual. In most instances, a person can sell something to someone else by agreement. You and I agree that my widget will cost you $100. You pay me $100 and I hand you the widget. Deal done. Of course, an attorney might tell you that if you want to be extra careful you could document the transaction by creating a Bill of Sale or some sort of receipt but in most instances the "handshake" deal would be sufficient. An automobile has one further level of intricacy: The Certificate of Title. 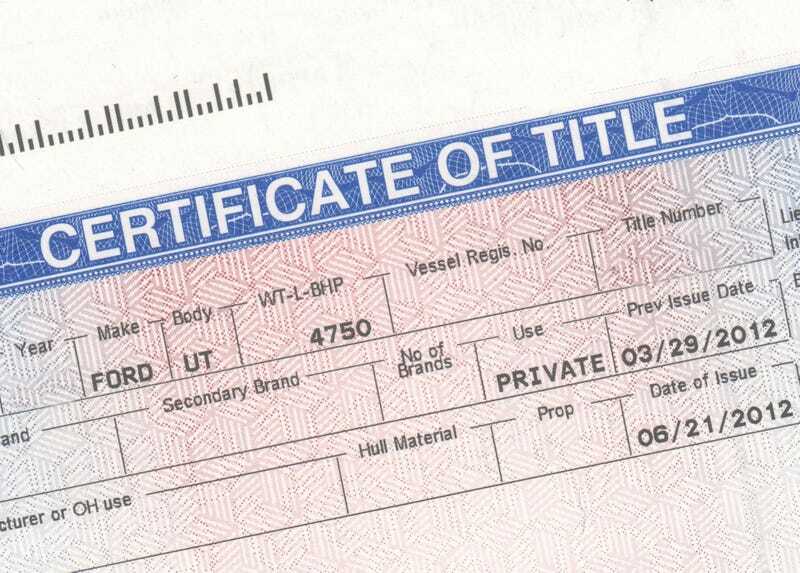 Most states track ownership of vehicles through the titling process. At any moment in time, someone can verify ownership of a vehicle by asking the state to confirm the last titled owner for a given Vehicle Identification Number. For example, if the State Police fished a car out of the local reservoir and were curious about its owner. Now, you want to sell your vehicle. You run an ad and find a buyer. The buyer comes over, looks at the car, kicks the tires and agrees to buy it. He hands you cash and you sign the title over to him. He drives off with the car and you have a pile of cash. Are you good with that transaction? Not necessarily. At this moment in time, the state still shows you as the titled owner of that vehicle. Suppose the buyer leaves your place, buys some crack and then smokes it while speeding through the nearby playground, running over children in a fashion that will make national headlines. True, they will arrest the driver but someone will also likely run a check to see whose car it is. Why? Among other things, many states have Owner Liability. That is, the owner of a vehicle is liable for things which are done with it. You might argue that this car is not yours anymore since you sold it a few minutes earlier. After all, you have some cash to prove it. Wait - Cash proves what now? There's that title you gave to the buyer – that's still around somewhere, right? Over the years I have heard many variations of what can go wrong with these deals. The guy who sold a car and several years later found out that the car had been abandoned after being ticketed repeatedly for being left on the street with no license plates. The state said all of the tickets and the impound fees were his responsibility because no one ever bothered to retitle or reregister the car. Or the sellers who have been sued shortly after the sale because the new owners hadn't gotten a new title, plates or insurance before getting in their first accident with the car. That Owner Liability thing I mentioned above caused sellers to get dragged into messy lawsuits. What could have been done to avoid this? Once you strike a deal, tell the buyer to meet you at the local DMV, Secretary of State's, or whatever your state calls the place that does car titles, license plates, and so on. This will allow the two of you to stand at the counter and apply for the new title together. AND, this way the buyer can also get license plates and drive the car off legally. Haven't you always wondered about those people who buy used cars privately and then drive home in them? I mean, everyone does it. It must be legal, right? Yes, this will be a slight inconvenience because it most likely means you cannot close the deal on a Sunday and the nearest office might be a few miles away. But at least you won't be getting that 4 a.m. phone call telling you that the State Police just fished your car out of the reservoir and they have a few questions: 1) Whose body is that in the trunk? 2) Is the 19 pounds of crystal meth in the trunk yours? 3) Will you be paying the $5,000 car retrieval costs by cash or credit? And 4) When can you meet with the EPA to discuss the remediation costs for the motor oil and gasoline with which your car just contaminated the county's water supply? Steve Lehto is a writer and attorney and has been practicing consumer protection and Michigan lemon law for 23 years. He taught Consumer Protection at the University of Detroit Mercy School of Law for ten years and wrote The Lemon Law Bible. He also wrote Chrysler's Turbine Car: The Rise and Fall of Detroit's Coolest Creation and The Great American Jet Pack: The Quest of the Ultimate Individual Lift Device. He urges you to consult with a local attorney to see how the article above comports with the law in your state.